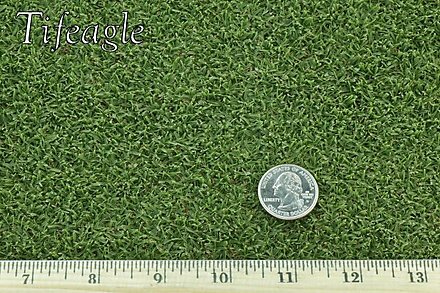 Fine texture, dark green color, and tolerance of close mowing are what makes TifEagle the highest performing greens-quality bermuda available. It displays high density, making for fast putting speeds and true ball roll. TifEagle exhibits less purpling in cool weather, and maintains its color longer into the fall. FOR USE ON GOLF COURSE GREENS, LAWN TENNIS COURTS, CROQUET PITCHES, and LAWN BOWLING GREENS. Dark green. Darker than Tifgreen. Fine and smooth. Finer than Tifgreen or Tifdwarf. Top rated for low mowing, overseeding ability, and overall quality of bermudagrass in studies at Tifton, GA. Provides the fastest putting speeds, and truest ball roll at lower mowing heights. Vigorous growth habit promotes quick recovery from injury. Overseeds easily, and transitions well in spring. Produces stronger root system than Tifdwarf in soil-based or USGA greens. Provides denser growth, narrower leaves, and more shoots than Tifdwarf. Dense growth repels annual bluegrass. Thrives in warm to hot climates, USDA zones 7-11. Thick-cut sod: has up to a 2” soil base that provides anchorage for the sod until the roots knit to the subsoil. Ideal for renovating a green that needs to be back in play within a few days.